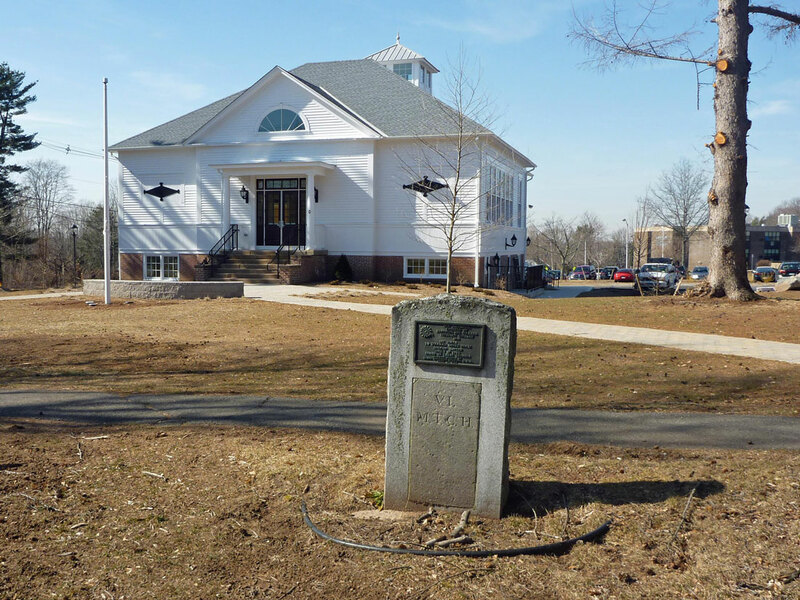 The next time you find yourself waiting at the traffic light at the corner of Center Road and Hartford Turnpike in Vernon Center look for the historic marker in front of the old kindergarten and new Vernon Community Arts Center. It is one of the few remaining Post Road mile markers. The milestone is set in a Barre granite slab and the tablet is bronze with the insignia of the D.A.R. Before the railroads stage coaches traveled regularly between Boston and New York along three post roads, including this one through Vernon along Hartford Turnpike. Each mile along the route was marked with a milestone placed by the turnpike company who operated that section of the route. Think of the milestones as an early form of GPS so travelers would know where they were. This is the only one that remains in this area. 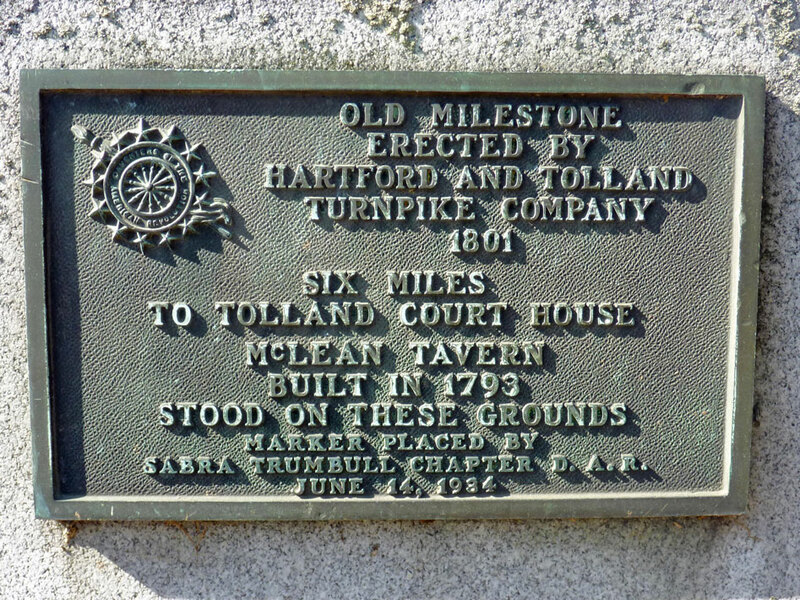 The Hartford and Tolland Turnpike Company was chartered in October 1801, seven years before Vernon would separate from Bolton, to build and maintain a road from East Hartford through Vernon to Tolland. Beyond Tolland other roads branched off. The following description of the road is from Wood's, "The Turnpikes of New England," published in 1919. From Woods "Turnpikes of New England." "From the courthouse in Tolland to the state house in Hartford seemed sufficiently promising for a turnpike to justify the incorporation of the Hartford and Tolland Turnpike Company in October, 1801. At that time the only means of crossing the Connecticut River at Hartford was the ferry, so at that ferry the turnpike was made to terminate. Goodwin, in "East Hartford History and Traditions," wrote that the turnpike followed the 'road coming from the ferry landing to Bigelow Hall Building and thence over Main Street to Burnside Avenue,' whence it ran straight to Bucklands Corner. In the eastern part of East Hartford it followed the old road called 'the road east near Gilman's Brook,' which was laid out in 1734. "For the first seven years of turnpike operation its travelers were wafted across the Connecticut River by the ferry until, in 1808, the Hartford Bridge Company was incorporated for the purpose of providing a toll bridge a short distance above the ferry. A monumental masonry structure now occupies the site of the old toll bridge. "The Hartford and Tolland Turnpike became later, when the Stafford Pool Turnpike and the Worcester and Stafford Turnpike were opened, a part of a through route to Boston by way of Worcester, and the indications are that a heavy travel passed over the road for many years. "The old road to the ferry is now known as Governor Street. Turning sharply to the left where the Bigelow Hall Building now stands the turnpike followed the lines of Main Street to Burnside Avenue, over which it continued to the present corner with Tolland Street. Over Tolland Street it went and crossed the northerly part of Manchester, through Vernon Center, to Tolland courthouse." 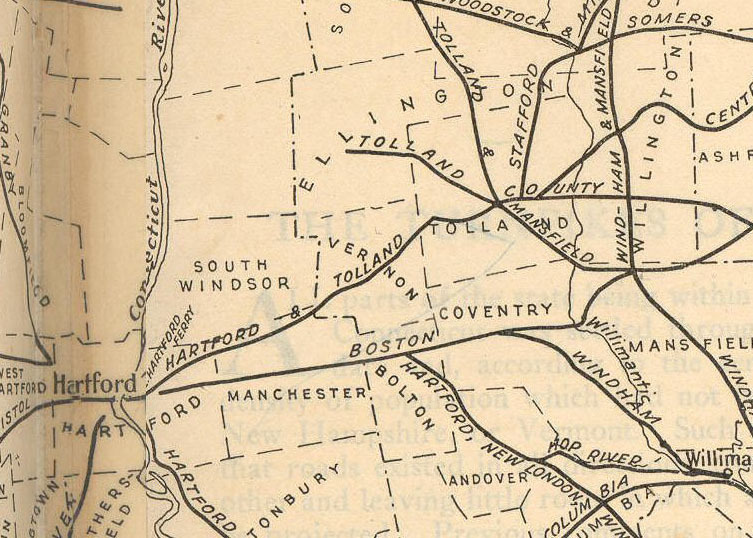 Thus the route from Hartford in the early 19th Century was Burnside Avenue, then Tolland Street to Buckland, then Tolland Street to the current intersection with Manchester's Oak Street at Exit 64, then on Route 30 on Talcottville's Main Street, to Vernon Circle, up Hartford Turnpike in Vernon to Route 74 in Tolland and on to Tolland Green. When next you find yourself on any of these roads picture the stages on dirt roads passing farms and stopping along the way at taverns for meals or the night. Think of those who travelled the same road two hundred years ago heading home or out on a business trip - just as you are. 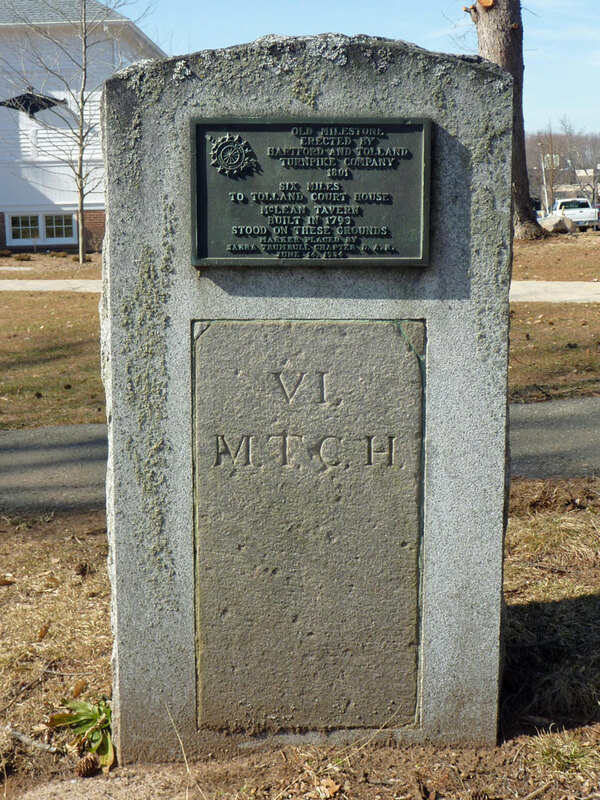 The tablet also refers to the McLean Tavern, where the stage coaches regularly stopped. The tavern was one of several in Vernon along Hartford Turnpike. It was built in 1793 by Alexander McLean. In later years this would become the location of the Tolland County Home. More on the history of this site later. "Cascades and Courage" by George S. Brooks, 1955, p. 35. "The Turnpikes of New England and Evolution of the Same Through England, Virginia, and Maryland" by Frederic James Wood, 1919. The entire text can be found and searched online. "Vernon, Our Town" from the Vernon Historical Society, 1989, p. 19.